The talented team of speech-language pathologists (SLPs) at YappGuru work incredibly hard to provide a credible, easy-to-use, searchable, and fun resource for people using aphasia apps in therapy and education. Created with the goal of uniting the therapy app world, the site now has hundreds of apps listed, reviewed, and posted. We're happy to host co-founder Aubrey Klingensmith at our booth Friday, November 13. If you're unfamiliar with YappGuru, here are five fun things you need to know about their team! Born and Raised by SLPs: YappGuru was created by and for SLPs. The vision for YappGuru began with a few tech-loving SLPs and their pioneering, patient, and passionate, beta-testing App Experts. Today, the founders wear two hats: practicing clinicians and therapy app reviewers. They Love Blogging: In addition to maintaining active speech therapy practices, the team at YappGuru loves to blog. Writing on everything from the Apple Watch (read the post here) to reviewing Lingraphica's app (read the post here), the YappGuru team spread the "app gospel" far and wide. They Know Apps: Whether you've used therapy apps for very long time or you just started incorporating them into your practice, you’ve likely heard some concerned colleagues, administrators, or parents asking, is this app private enough? What about HIPAA? Do apps even have any research behind them? YappGuru tackles these question with real-life feedback from other SLPs right on their site. Click on any app and read detailed information about the product. ASHA CEU Provider: YappGuru is an official ASHA CEU Provider! The team is working hard to introduce CEU courses on technology, iPad, and app-related topics. Launching soon. 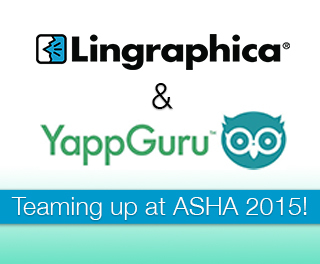 If you're attending ASHA, please stop by Lingraphica's booth #332 on Friday to meet and connect with the YappGuru team. Also, don't forget to check YappGuru out on social media. YappGuru's Facebook Page, Twitter, and Pinterest. Also be sure to keep an eye on YappGuru’s blog.